The main character of this film Lee Hayden is a wreck. His golden days as a movie star are many years behind him and won’t ever come back. His daughter Lucy avoids him, his once co-star has become a drug dealer — the latter is very convenient, if you want to buy some marijuana, and God knows, Lee does. Then Lee is diagnosed with cancer and there is nothing to lose anymore. He meets a charming woman named Charlotte, falls head over heels in love with her and starts a relationship. 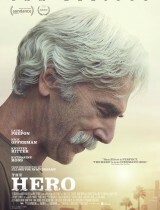 Once Lee was called “The Hero” — a great actor in a great film. Is it still possible for him to repeat the success?